Are ride-on lawn mowers as good as they sound? If your lawn resembles anything more than a nature strip, or you live on anything bigger than half an acre, have you considered purchasing a ride-on mower? Ride-on lawn mowers may be the key weapon for surly groundskeepers and old fellas on acreage, but if you live on anything sizeable, a ride-on mower can be time-saving and even a little fun. Read Canstar Blue’s guide to find out if you have a ride-on lawn mower-sized hole in your heart as we compare models, features and prices. There are three main types of ride-on lawn mower at the hands of the mowing enthusiast – rear engine models, lawn & garden mowers, and ‘zero-turn’ ride-on mowers. If it’s a cheap lawn mower you want, you’ve come to the wrong page. Rear-engine mowers are about as basic as you can get in the ride-on mower space, and may also be cheaper. 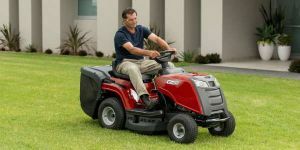 Rear-engine mowers often feature power levels similar to that of higher-end push mowers, and offer the same versatility, except you sit on it. Rear engine mowers usually feature smaller chassis and cutting widths, making them ideal for smaller lawns and sneaking through tight spaces such as gates and fences. Rear-engine ride-ons often lack the grunt of other ride-on types. However, the convenience factor and small frame may make it worthwhile for lawns that aren’t so big. These are probably what first come to mind when you think of ride-on lawn mowers. With an engine at the front, and grass dispersal often to the side, these ride-on mowers are a common staple of any property over one acre in Australia. Compared to rear-engine mowers, there is often more engine power, with much wider cutting widths of 70cm or more to make larger yards get a good chop. Perhaps the most peculiar, zero-turn mowers feature super-tight turning circles, with the ability to make a 360° turn possible. Most feature large cutting widths of 100cm or more, making short work of most lawns. 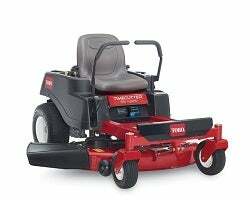 Zero-turn mowers also feature higher top speeds, with a lightweight frame and comparatively high power figures. Zero-turn mowers are somewhat of a premium compared to other types and are best suited to manicuring fussy lawns, fields and golf courses, but they do represent a solid option for those living rurally on a big lot who take a lot of pride in their lawn. Suburban dwellers may not see much use in a zero-turn mower, however. If you know what type of mower you want to buy, you’ll probably want to consider some of the features that can either make or break your mowing experience. Rather than just spit out grass, some mowers catch it or send it through an on-board mulcher to allow for easy grass recycling. Mowers without this feature aren’t necessarily worse-off but it all comes down to what you prefer. Yes, you get the choice of transmission, even on a lawn mower! Like cars, automatic transmissions on mowers are much easier to use, however manual transmissions are still often cheaper. However, you have to consider, is it worth the few extra dollars in your pocket for the extra hassle of having to change gears? Just like a car, a manual transmission may suit those who like ultimate control or who find it engaging, but for the vast majority an automatic may get the job done more conveniently. Weight is a huge factor, as it can not only impact the performance and manoeuvrability of your mower, but it can also impact driver safety. This applies on hills especially, as lawn mowers can weigh in excess of 100kg, and with a rider on top can skew centre of gravity. For maximum stability on sloped surfaces, an all-wheel drive model may be a preferred option, but may cost more. However, can you afford to injure yourself in a roll-over accident? What size ride-on lawn mower do I need? 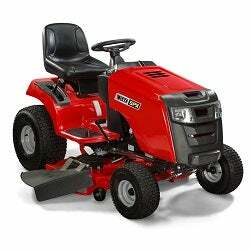 Ride on mowers come in lots of shapes and sizes, with various cutting widths and engine capabilities. Keep in mind that many mowers still feature specifications in imperial measurements, as many brands cater towards the US market. Lawns half an acre or less may be more suited to a push mower. In Australia, the top ride-on mower brands feature two Yanks and one Aussie – John Deere and Toro, and Victa. Perhaps synonymous with rugged versatility and the vast American prairies, John Deere features a large range of mowing solutions, but its consumer ride-on catalogue is quite concise. As you’d expect, the 100 Series generally offers the most basic functionality, with power figures starting at around 13kw, and the prices starting at a little under $3,000. Cutting widths start at 42”, making them suitable for lawns up to one acre. On the other hand, the X700 series is evidently the ‘Major League’ of John Deere mowers, with power figures around 18kw, with massive 54” cutting widths. The prices are reflected in this, starting at around $15,000 and other models costing over $18,000. John Deere is often a name first associated with mowing, with its green and yellow colour scheme. Don’t forget your John Deere hat! The TimeCutter SS series is the most entry-level series out of the five, with cutting widths between 32” and 42”. 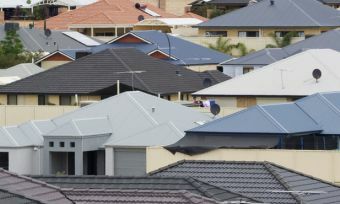 This makes them suitable for zipping around yards up to one acre – yet Toro says they are suitable for lawns up to 3 acres – and the costs start at about $5000, making them a pricier option for smaller lawns. On the other hand, the Titan HD series is the bees’ knees when it comes to maximum cutting ability. Cutting widths start at 48” with power figures over 18kw. Prices reflect this, starting at about $10,000. Many feature Briggs & Stratton engines, with horsepower figures starting at about 20HP for the SPX. Cutting widths for the SPX series start at about 48” as well, while the VRX and ZTX series offer slight variances of this. The VRX series seems to be cheapest – starting at around $3,000 – which makes it a viable option for those who are perhaps more price-conscious. Best of all, Victa mowers are often used in mowing races; just check out the video from 2011 above, featuring the legendary Don Burke! Is a ride-on lawn mower worth a cut of my money? Absolutely… if you have a lawn to justify your purchase. Ride-on lawn mowers are convenient, can be fun, and are best suited for lawns over one acre in size. However, you’ll have to weigh up whether it’s worth spending thousands for even the most basic ride-ons. Prices start at around $3,000, and if your property size is around one half to a whole acre, you might want to think about a push mower instead. This can save thousands, but for any lawns larger, the convenience factor of a ride-on must also be considered. 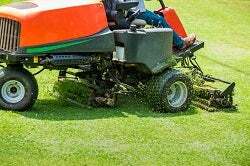 There are some exciting ride-on mowers out there, and the top brands offer class-leading cutting widths, power figures and extra features, but be prepared to pay for it. Overall, there are a few things to weigh up before purchasing a ride-on mower, but the most important factor is to look outside and weigh up the size of your lawn.